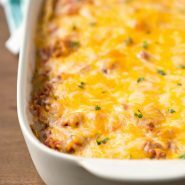 Overnight Mexican Breakfast Casserole is a tasty alternative to the traditional overnight breakfast casserole. This easy, make ahead breakfast is packed with flavor and is sure to please! I am not big on making huge breakfasts. When I get up, I’m all about getting everyone fed quickly. Plus, I’m hungry. So, if we’re going to have something more elaborate for breakfast, it has to be made the night before – like this Overnight Mexican Breakfast Casserole. One of the reasons that I like this breakfast casserole is that it’s a nice alternative to sweet breakfast casseroles. It also works really well as a breakfast-for-dinner option. We love having breakfast for dinner, and meals like this are perfect because they can be prepped earlier in the day and then just popped into the oven a little while before we’re ready to eat. This breakfast casserole recipe is also really flexible, so feel free to make substitutions like chorizo for the bacon, extra beans for the bacon, or anything else you’d like. 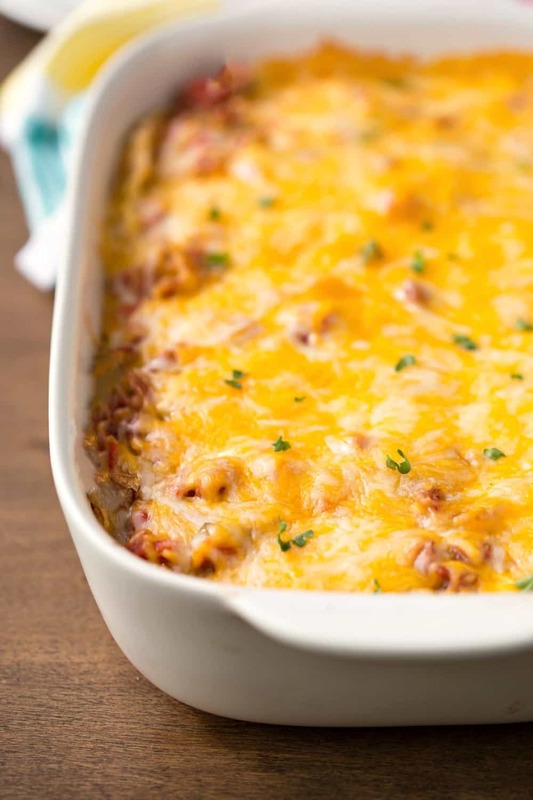 If you’ve tried this overnight Mexican breakfast casserole recipe, don’t forget to rate the recipe and leave me a comment below. I love to hear from people who’ve made my recipes! You can SUBSCRIBE to receive my latest recipe newsletters or FOLLOW ME on FACEBOOK, INSTAGRAM and PINTEREST for even more delicious food. Overnight Mexican Breakfast Casserole that's full of flavor! In a large bowl, stir together black beans, Rotel, and salt. Spread heaping 1/4 cup of bean mixture on the bottom of a greased 9x9-inch baking dish. Place 4 tortillas over the bean mixture, overlapping tortillas slightly. Layer half of bean mixture and then 1 cup of shredded cheese over tortillas. Add another layer with remaining 4 tortillas. Sprinkle crumbled bacon over bean mixture. In a separate bowl, whisk together eggs, milk, and Tabasco sauce. Cover, and chill for at least 3 hours or overnight. Spray one side of a sheet of aluminum foil with nonstick cooking spray, and cover baking pan tightly with foil. Return to oven, and bake, uncovered, for another 5-10 minutes, or until cheese is melted. Let stand 5-10 minutes, uncovered, before serving. Can the Mexican Brkfst Casserole b frz prior to baking?? Do you have suggestions in regard to proportions to make this a little larger to fill a 9×13 pan? Hi, Kari! I think you would be ok to double all of the ingredients for a 9×13. Also, I’d add about 10-15 minutes to the initial cooking time and then keep going as-needed from there. Hope that helps! I will likely make this for a gathering we are having but I can not have corn. Have you ever had success making this with flour tortillas? Do you think that the regular Tabasco (not the chipotle variety) would make a big difference? I’m planning on making it tomorrow and am trying to save myself a trip to the store.